Because, let’s face it, none of us culinary-challenged college students are going to pull off cooking a turkey successfully. You know what we can handle, the goodness that is Almond Bark. Almond Bark is a delicious chocolate concoction that is solid but once heated up properly will liquefy, and harden back into a solid after cooling. It’s like chemistry but with chocolate. Almond Bark can be found in the baking sections of most stores, the most common flavors are chocolate, and white chocolate. Follow heating instructions found on the packaging, and use a small amount for a test run. You don’t need a double boiler to make good Almond Bark. Now some of the great things about Almond Bark is that you can buy in bulk, it stores well, you can add flavors (such as shavings of peppermint candy cane, or basically any hard candy), you can change the color of the white bark, and the coolest thing is that there is quite literally NO LIMIT to what you can dip in Almond Bark that won’t taste better for it. You can get crafty like the creations on Pinterest by adding colors, drizzles, sprinkles and/ or bits of cookie or candy; or you can simply put your goodies on a cookie sheet or the counter, just make sure to cover the surface in wax paper. This will allow you to remove your creations after the have solidified easily, without breaking, and without mess. Another tip I would give is to soak all cooking equipment and utensils in hot water, trust me this makes clean-up much easier. I have a list of goodies you can add to Almond Bark below. Yummies to dip in Almond Bark: crackers, cookies, pretzels, fruit, nuts, raisins, other candy, popcorn, marshmallows, Chex-mix, etc. Your imagination is your limit. I have compiled some interesting recipes to try but feel free to make it up as you go. Melt your candy melts or white chocolate in a microwave safe bowl for 30 seconds. Stir. Repeat the 30 second intervals (stirring in-between) until chocolate is nice and smooth. Dip the Oreos into the melted chocolate, allowing the excess to drip off into the bowl, and place them on wax paper or parchment paper. 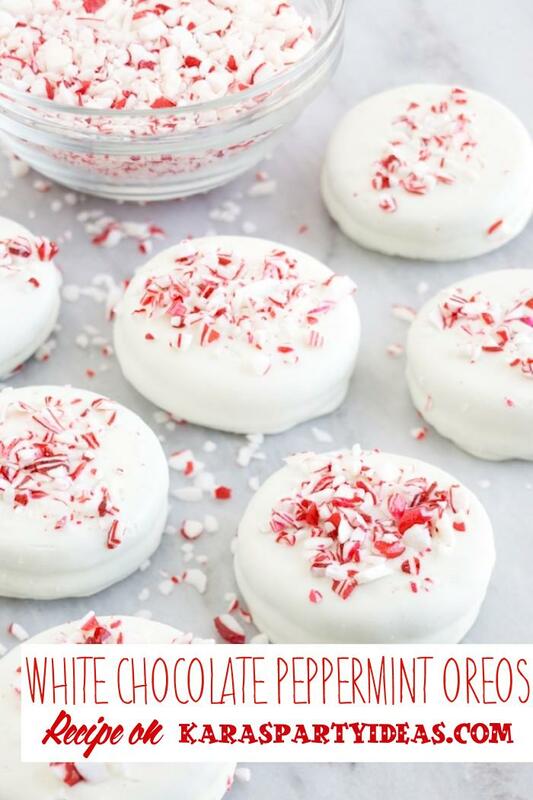 Sprinkle the crushed peppermint candy over the Oreos (do this before the chocolate is completely set so the candies will stick).